Its been brought to my Attention that the same person behind the Fake Facebook and Twitter pages, also created multiple fake Instagram accounts to Impersonate me in hopes of luring in clients off my reputation. I would like help getting these fake instagram account shut down for good. It's not only harmful for someone to accidental fall victim to an impersonator, it also harms my reputation. I would like to thank the member who brought this to my attention earlier today. Nintendofan3, Claire Louise Carter, Cheryl77 and 1 other person like this. Oh my god. I can't believe how hard they are trying to harm your reputation. Its totally unacceptable. They are using your good name to make profits for themselves. Such a mischievious act. They even stole video reviews from youtube too. Look how low they can stoop. 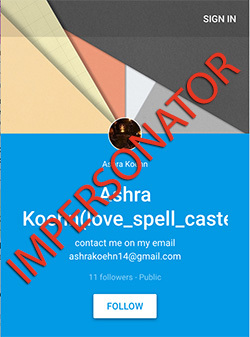 Don't worry Ashra, we will try our best to help people avoid such impersonators and lead them to the right site. I have just reported this fake account .I think it's dispicable that people think it's ok to steal people's identitys and use them for success. I am so sorry this is happening to you Ashra me and many other forum members ar here to help you shut down these impersonators so they don't steal your clients and people's hearts. 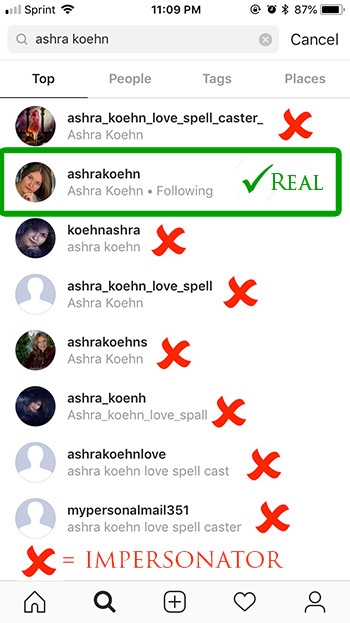 "***Public Warning: This Instagram account belongs to an Ashra Impersonator. Its Illegal to steal copyrighted material from Ashra to try to convince people you are Ashra when you are just impersonating her. The real Ashra Koehn can be found on https://www.ashra.net/community/"
Only this this part, after you have reported their account. @Ashra i am more than happy to do this . @Sophierebecca140100 it’s awful isn’t it . I just check on instagram and follow Ashra verified account. I try to search Ashra Koehn and there are multiple result. I notice that the impersonator use the same email for multiple account but with different user name. They can't even spell the word "spell" correctly. I have report each and every one of it. I even read few comments, I feel pity to those who fall as victim. I just reported the account to Instagram . I hope it gets look after. They say the account will be blocked by instgram! I hope they do. I'm sorry Ashra for this to be a on going problem for you. I see the person has lots of followers. I feel sorry that they are being fooled my the wrong person. Let's hope it helps you. I love you so much my dear @Ashra. Wow! I received another notice about an Impersonator on Google Plus. The person behind this clearly has made it their full time job to commit Identity Fraud as a means to harm others. Can you do anything to these people for faking u Hun? Its insane that people are that miserable in thier lives that they do this kind of stuff to hard working spell caster like ashra. Hello everyone How are y’all doing today so far? They actually followed me on Instagram. I’m guessing they looked through Ashra’s followers on her page. I had a feeling that they were fake but I wasn’t really sure. I already reported them. I really wish people would stop pretending to be someone that they’re not. There’s no point in doing it. Tricking people is very wrong. I really hope that no one else will get tricked by them or anyone else and will find Ashra’s real Instagram account. @Samanthalily the accounts don’t come up on mine any more since I have reported them. I will definitely report thi account. Thank you for letting me know that these accounts are fake because a few days ago I wad looking foe r your account on Instagram and Twitter. I wish these people would stop stealing other people's work. And Ashra can you check your emails? @Gemmbo1983 I have been taken advantage big too by a different spell caster it is horrible that people do this too her. I reported both the accounts. I hope it gets closed soon. Its really unbelievable how much time they are investing in such fraud activities. I wish soon they learn their lessons. Dear me, how many fake accounts are out there?? Each one that Ashra brings to our attention, I go and report it, but it's getting way out of hand. The things people will do for money; they'll tarnish a reputation and steal from people they don't even know, all for the almighty green. Well, I know it's easier said than done, especially with it being in countries like Nigeria, Togo, and sometimes Namibia and the Cote de Ivorie (Ivory Coast), but they need to find an honest way to make a living instead of pulling scams. Karma is gonna come back on them in the worst way possible. Personally, I'd rather be poor than to pull a con. @Gemmbo1983 OMG !. How could someone say such horrible things to you Know wonder you have trust issues. My situation doesn't sound as bad as yours but it has put a lot of negativity in my mind and I also have trust issues. I have seen so much positive movements from my spell so there is no need for us to worry anymore. Things will work out just fine for you , I wish you the best and am sending alot of positivity your way . Stay strong Hun , you've got this !!. Instagram has blocked Impersonator's account now Ashra.. I reported but I got notification it is now blocked because it's been reported. Thank goodness for that. Giogle+ is showing error 404 so probably fake profile is also gone. @Ashra I have just reported the fake Instagram account too. This is really not on, we all come to Ashra when we are in an emotionally vulnerable state of mind, and its quite easy to get taken in my these fake people, and the negative comments that are around. Its so hard to trust, and unfortunately a while ago the real Ashra had the brunt end of my frustrations due to doubts I had that were fueled by these very people. I felt awful afterwards! Ashra is busy enough helping us all without having to deal with these impersonators trying to damage her excellent reputation. @Ashra I hope you are managing to stay motivated, and know that we are all on your side, appreciating the hard work you do for us! Can someone explain to me what's going on... I'm very confuse to what is happening..... Thank you for letting me know. 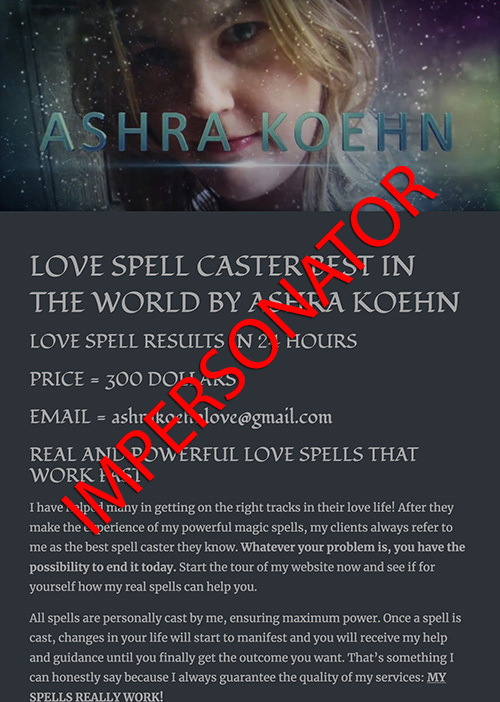 @Pilar Engram , there are fake spell casters who are calling themselves "Ashra Koehn" and creating fake social media profiles to trick people. This is something that happens to celebrities, popular people and even popular companies. Below is an image of the fraudulent and fake website they created. Damn @Ashra thaks for your update, someday, someone will hit them hard till they wake up from their mistakes. @Ashra they had a instragram under that email I have reported it but not sure if it’s still live. A few forum members alerted me to their scam. Here is a screenshot of the Impersonator making contact with them. 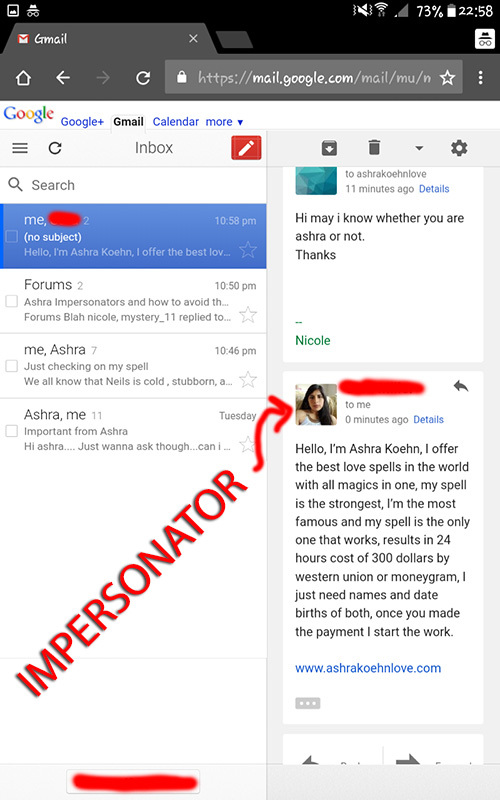 I would encouage anyone who have had an encounter with an Ashra Impersonator to send evidence so that I can review it and post a warning on the forum. Note: A lot of these scammers are located in parts of the world that are known for scams. NEVER send money via Western Union or MoneyGram. Cripes, these people are relentless. One down a few others comes up. Is there anyway of knowing who the person or persons are behind these impersonators? Ashra can you watermark all social media profile pictures? Also, I think like other public figures your Accounts should get verified. Just a thought. Thank you. @Andib , I've taken your suggestion and I have started to add a copyright © water mark to my photos. It will do no good to the original impersonator, but it will help stop future attempts where someone is trying to steal my identity. I am sure this scammers are from Nigeria. Idemudia Princely Peter and also Shaunna Tilley. I've got all the information. The writing styles are the same. They are known for their fraud and scams in the love chat and love spells. I strongly believe it is them. This whole thing is so sad. I think we all agree that @Ashra has better things to do than deal with these persons. Maybe a vacation would be in order after all of this. Hope it's possible soon. 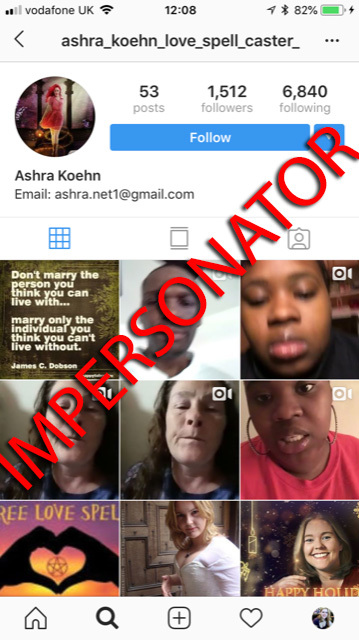 I had reported the impersonator that you all were talking about and then they had made another Instagram account with their username being "ashra_koenh." I had known who they were because their name was "Ashra_koehn_love_spall_" and had the same email address. However, I also had reported that account as well too. I hope that whoever it is that keeps impersonating you stops because it is truly unfair and they should be banned.